For some reason I haven't figured out, I don't feel like talking about Hurricane Ike yet. So even though I have many photos to share, I'll put that on hold. 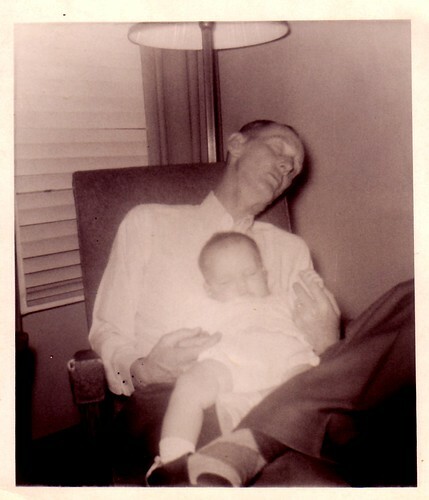 Today my father would have been ninety-four. His own father died when he was ninety-six. It's not hard to imagine what our relationship would have been like if I'd had those additional decades with him. The older I got, the more I appreciated him. Both my parents warned me, when I was a surly young thing, that the day would come when I'd wish for time with them again. Fortunately, they did this with humor--they had once been children, too. I'm lucky enough to have realized when my parents were alive that every parent and child are on a journey together. While no journey is without its pitfalls, every bump in the road or detour is not a disaster--just part of the trip. In my study, there's a picture frame with a photo of my father in it. Engraved into the wood is a poem by N.P. Randall, about whom I can find nothing on the Internet. Every day of my life has been a gift from my father. His lap had been a refuge from lightning and thunder. His arms had sheltered me from teenage heartbreak. His wisdom and understanding have sustained me as an adult. Maybe this is a Hurricane Ike post after all.